Special Needs Children. DS Broward Down syndrome Contact Us. 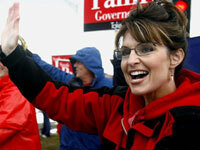 Sarah Palin has a son with DS. At her speach, she said to parents of children with Special Needs, she will be a "friend and advocate". Ron Saint John invited Bruce to do a 30 min. show talking about DS for Majic 102, which he did. We aren't allowed to put it on the site, but it was a lot of fun, and Ron is a great guy!